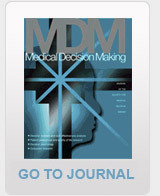 SMDM is a great opportunity for me to stay connected with colleagues and to be informed about the latest developments in medical decision-making research. The Society has welcomed me in a very warm way and to me it has been a pleasure to be a link between Brazil and my colleagues from around the world through conferences, teleconferences, short-courses and exchange of ideas. I have participated in both the international and regional meetings, which were very rich moments for my career development. I hope the presence of SMDM will grow in Latin America and I am glad to be a part of it.